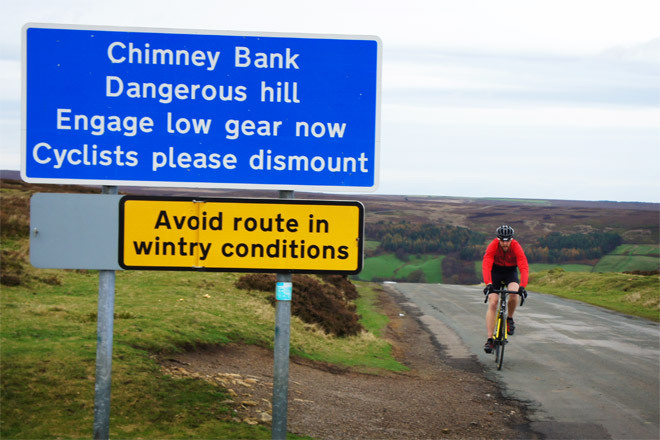 The infamous Chimney bank, often referred to as the steepest or joint steepest road in England (Not Wales they have a steeper 40% climb). The internet is full of comments about chains snapping on the way up and professional cyclists having to walk up it during the tour of Britain/milk race. If you’re oblivious to all this there is no ignoring the very obvious sign at the top warning of a “Dangerous Hill” and politely requesting that cyclists dismount to descend it. There is however no direct warning about cycling up it, the sign stating that it is a 1 in 3 hill should be warning enough to most. What English hills lack in height they make up for in gradient, and the gradient in question is 33% at its steepest. 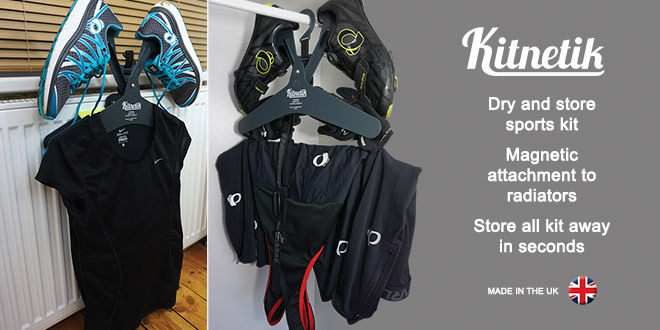 More then enough to make you think about your gear ratios and question if this is even possible for your legs and bike. The bike I was using for this is a little over geared for Yorkshire hills so in preparation I’ll admit I did have to purchase a new rear cassette with a slightly larger (28 tooth) rear sprocket. The road into Rosedale Abbey from Egton Bridge is one of my favourite roads in the area, high up and exposed on top of the moors, the feeling of remoteness on this quiet road is something to be savoured along with the view. Thick heather on both sides of the road, with excess water running off the peat bogs and running across the tarmac. Shooting butts stand just off the road and the well camouflaged grouse cry out from somewhere amongst the heather. A stone cross stands overlooking the village of Rosedale Abbey. The view over the village, with a copse of trees standing atop a small hill in the valley below is beautiful. Yellow painted bikes, cycling sculptures and bunting still adorn the roadside buildings and gardens in the village, still present from when the Tour de Yorkshire passed through earlier in the year (May 2015). The route did not unfortunately take in the infamous Rosedale Chimney however, opting for climb up to the stone cross, now known as Côte de Rosedale Abbey. Turning off the main road in Rosedale Abbey the road to the chimney tightens over a bridge, the water of the river visible to the right before the road turns left. The road feels hemmed in by trees overhead, their leaves scattered across the road, and the shelter from the wind keeping the road wet on the lower slopes. It’s November and the brown leaves are collected in wet decomposing piles as they have washed down the hill, making for slippery obstacles to avoid. Passing the national speed limit sign it’s time to get into the smaller chaining and start to pace myself. Keeping the heartrate manageable for the real test to come. Passing the Inn on the right, and then the cattle grid, the road bends into the hillside and out of sight as I approach the first hairpin. Wow that’s steep! I can’t sit down, the light front end of my bike won’t let me stay seated, threatening to lift off the ground and unbalance me. I’m in my lowest gear and taking a wide line to the left to decrease the gradient that ramps up on the inside of the corners. The second hair pin, I can see the road is clear so I take it wide to the right to take a little more gradient off and keep my pace as high as possible. “That’s it right?, 2 hairpins done, worst bit over?” I think to myself; my breathing now at maximum and the sound of it growing louder within my head. But that is not it; a last steep kick comes straight after the second hairpin. No time to recover, if you’ve gone too hard too soon this section is where you’ll have to dig even deeper or admit defeat. It’s all a cruel trick, hiding the steepest 3 sections just out of sight of each other. Entering each section blind to the road ahead with a sudden reveal as you round each corner, and each one pushing you successively closer to your limits. Forget my legs, it’s my arms that are giving way. Hanging onto the handlebars and writhing the bike from side to side underneath me as the sound of breathing overwhelms my head space. I’m in the red but the gradient won’t let me ease off, if I begin to slow I’m in danger of grinding to a halt. My line starts to wonder I wobble sharply to the right, my aching arms struggling to control. I can see it ease off just here, by the green grit bin. A sheep casually walks up to the grit (road salt) bin and slides its head under the lid, consuming the salty contents, before trotting away as I draw near. I can sit down, the 33% gradient is over, I can do this, I’m starting to catch my breath again. I’m back in charge of my heart rate and breathing. Changing up through the gears, finish strong, I’m going to sprint to t….. oh damn it, that headwind is really strong today! A classic UK climb, in a beautiful location. it’s only a matter of time until it’ll be the highlight of a Tour de Yorkshire or Tour of Britain stage once again. Who wouldn’t want to see that? Nothing is more of a personal challenge than climbing, where rider power to weight can make such a huge difference to the magnitude of the challenge. Anything is possible with the right equipment, if you find it impossible with your standard bike gearing, buy a compact chainset with a 34 tooth front chainring, or a larger cassette. Check compatibility though, some changes will require a longer cage rear derailleur to allow for the larger change in chain length with some set ups. That said though, shorter steeper climbs such as this can be punched through with a bit of momentum in the right places, and minor recovery in others. It’ll all be over in a handful of minutes if you can keep enough power down. Think of the Chimney as a sprint of a climb, in comparison to an Alpine pass being a carefully paced marathon. Great stuff! 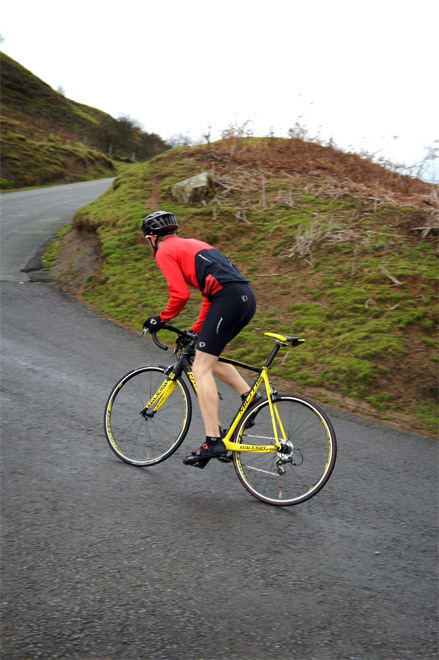 I’ve ridden much of the steep stuff in Yorkshire but never this one – I must have a crack at it. I can certainly relate to that feeling of your arms giving way as you wrestle the bike upwards with your whole body. Great description. Last time I rode it I was overtaken by a massive tractor on the second hairpin, which forced me into the dirt and into the red; not good. 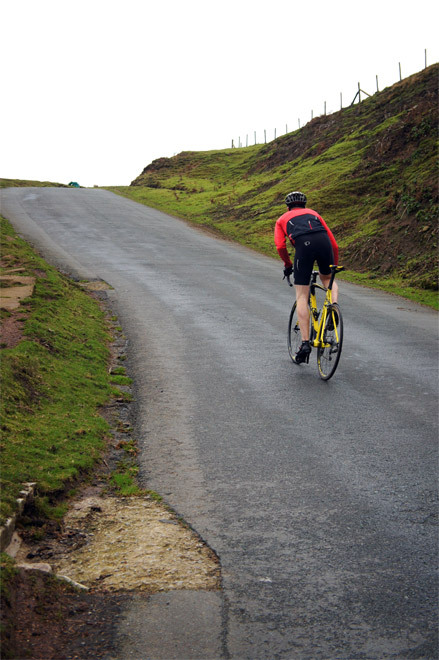 A great hill to ride though, not too long but highly rewarding. There are arguments amongst the Whitby roadies about which is worse, The Chimney or Caper Hill. Me? I can’t cope with either. There are plenty of steep hills to choose from around Whitby. Runswick bay bank can see cars struggle and there is another 33% one between Egton and Egton bridge. The chimney is a bit of a classic though. The Delves, Sledgates, Church houses, its a climber’s heaven! That brought back the week I spent this past summer just outside Rosedale Abbey. The cycling is fabulous. I roamed all around and as has been said, there are plenty of lung-busting climbs in beautiful landscape. Glad you enjoyed your trip. Yorkshire cycling is getting a lot of attention at the moment, well deserved in my opinion.